Ghost of Valentine : Do You Believe in One? With a strong script, fine acting, and excellent direction, writer-director Yuthlert Sippapak’s latest work Ghost of Valentine makes the audience jump with fright, laugh with tears, and speak endlessly of soul mates and destiny. At its heart, the film is a romance. 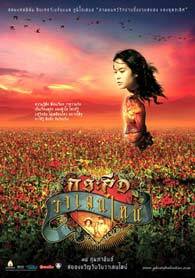 It tells a story of a heartbroken nurse named Sao (Ploy Jindachoti in her big screen debut), who moved to Bangkok and, on Valentine’s Day, started working at a dilapidated hospital where she befriended a crooked-mouth and disfigured-legged janitor named Noom (Pitisak Yaowananont in another impressive performance). There, she discovered a torn 1941 photograph, which suggested that she and Noom were estranged lovers in their past lives and were destined to be together in this life. Yet, this romance lies underneath a covering of a horror and a fantasy film, as during the course of the movie Sao discovered herself to be a krasue, a Thai ghost which looked human during the day but at night detached its head and entrails and flew around looking for discarded fetus placenta to eat. Ghost of Valentine demands from the audience a leap of faith for its many improbabilities, such as an immediate cure for a full body paralysis and an existence of a krasue despite the physical and physiological impossibility of a head seamlessly detaching and reattaching and floating on air. Once the audience establish this fundamental assumption, they can enjoy such touching scene like when Noom apologized the action in his past life to Sao’s headless body. This scene, among others, demonstrates the magic that Yuthlert can create—a scene that is brutally funny, delightfully terrifying, and disgustingly romantic all at the same time. Furthermore, Yuthlert cleverly weave different genres and subplots into a strong and coherent story through the concept of karma—how Noom and So’s actions in their past lives led to their tragic ends. While I cannot reveal any more details of the plot otherwise I would risk spoiling your enjoyment of the movie, it is suffice to say that every element in the film is essential and interconnected. However, the audience must patiently, if not frustratingly, wait until the last 10 minutes to learn what happened to the young couple in their past lives, why Noom had disfigured legs, why (but not how) Sao became a krasue, how was the devilish hospital director crucial to the plot, who the flower-selling girl really was, and what the rose, the rash, and the lone patient in the ward all meant. The only illogical explanation, it seemed to be, was the need for this mysterious old man who kept appearing at various points of the plot. I wished these revelations were distributed throughout the film instead of sidetracking with too many comic reliefs (like a scene with the two easily frightened policemen) and unnecessary scenes (like a sequence on krasue hunting). Interestingly, Ghost of Valentine keeps silence about Yuthlert’s choice to feature a krasue as his protagonist. Is he trying to say that someone so disgusting is the one who is often most vulnerable and needy of love? Is he perhaps emphasizing loving someone for the “inside” and not for the outer beauty? Or, is he equating true love and soul mates with krasue—a fantasy so impossible and outrageously old-fashioned by modern standard? The film does not answer. It only raises questions. But, if you wish to neither question nor discuss, you can simply sit back, relax, and enjoy a perfectly entertaining movie, with or without your soul mates.